A turntable can be a smart and stylish addition to a home entertainment system that provides the listener with a unique way to collect and hear music using a mix of old and new technology. 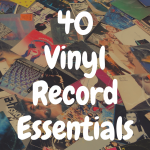 Turntables vary widely in both price and features and navigating the marketplace may be confusing, whether you are new to buying vinyl records or an estranged vinyl lover looking to get back in the groove. And so, in this article, I’m going to provide you with my list of the best belt drive turntables under $500 you can get on the market. I’ll also go into depth regarding why I think each one is unique and worthy of your consideration. 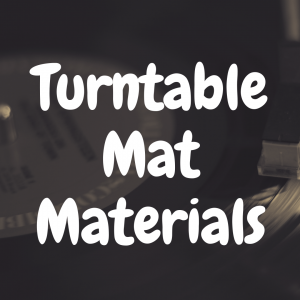 To better help you make the right choice, please use the table below, which lists some of the most popular affordable turntables on the market. What Are Belt Driven Turntables? Belt-driven turntables are the variety of record players where the electric motor that provides spinning action is separated from the record player’s platter mechanism, reducing the transfer of the motor’s noise to the sound output of the player. A rubber belt connects the motor and the platter to drive the player’s spinning motion, thus the name “belt-drive.” There are belt-driven record players at a wide range of quality levels and price points. The alternatives to belt-drive designs are “direct-drive” turntables, where the motor is located directly underneath and connected directly to the spinning platter with a gear mechanism. Direct drive turntables can have advantages in higher torque transferred to the plater and less variation in speed, which have made them popular in club settings since the 1970s. Given the subject of this article, one might wonder, why only discuss belt-drive turntables and not any direct-drive models? Direct drive turntables are highly prized by DJs for their control and reliability, and in the middle price ranges they may have sound advantages by reducing the background noise which may be caused by the turntable’s motor. But at the prices of the turntables reviewed here, a belt drive option is more likely to put out clear, noise-free sound than the direct-drive units in the same price range. If your goal is to listen to new and old records with rich, clear sound and minimal noise, there is hardly any reason to consider a direct drive unit. One thing that all the players recommended here have in common is that none of them are record players with built in speakers. Turntable models that have the speakers onboard—we’re looking at you, Crosley—may look pretty and are simple to set up, but they are often built with very cheap speakers, not to mention other low-quality parts that won’t make your records sound good. If you’re reading this looking for advice on purchasing a record player, chances are good that you’re not making your purchase decision as an impulse buy at an Urban Outfitters store. Good for you! 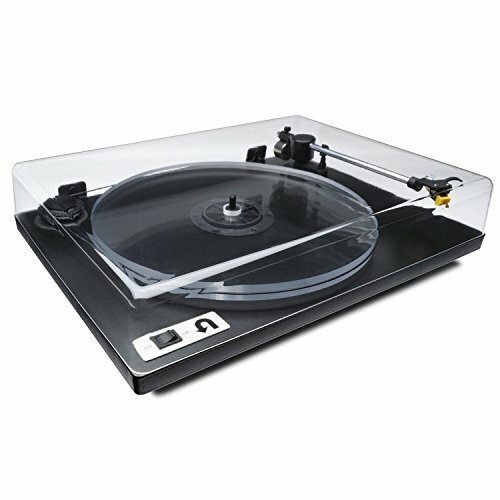 The record players discussed below are all a better choice than almost any of the all-in-one models both because they can produce better sound (when paired with good quality speakers) and they are less likely to harm your records by pressing the player’s needle (hereafter called a “stylus”) down into the vinyl surface. Additionally, all of these players are meant to go together with at least a set of amplified speakers in the simplest setup. Many users decide to outfit their listening room with a traditional hi-fi amplifier and speaker setup. If you go this route, it’s helpful to look for an amplifier with a “phono” input that pre-amplifies the otherwise very quiet signal that record players traditionally produce. If you aren’t playing to an amplifier with a preamplifier function, some of these turntables will require you to purchase a seperate pre-amp device. Automatic arm control – Provides built-in mechanisms that automatically place the tone arm on the outer edge of the record, and then lift the arm up and put it back in it’s resting place when the record is over. Built-in pre-amp – As discussed above, many newer player designs have pre-amplifier that boosts the signal out of the player before sending it out to an amplifier, eliminating the need for a separate pre-amp device. 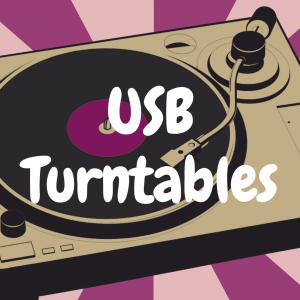 USB output – Some record players, especially at the low-end of the price spectrum, include a USB cable in addition to traditional sound cables, to allow digital recording of records onto a computer, to make MP3 backup recordings of your records. Audio damping – Many record players include features in the base, under the motor, or on the tone arm to stop background noises and vibrations from impacting the sound output. 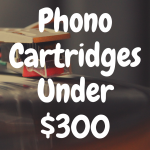 Upgradeable needle cartridge – Needle cartridges that come with many turntables are not interchangeable with any other cartridge, so what you buy is what you get. 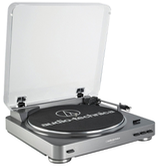 Let’s begin with a popular record player by Audio-Technica. The Audio-Technical folks have truly succeeded in producing a turntable that will be the best low-cost choice for most new vinyl enthusiasts. This machine sounds pretty good for its price and has tons of features like automatic arm control to simplify the record playing experience and a built-in pre-amplifier so you can plug and play on just about any system with an input. It also comes with some great accessories to benefit your playing experience, like a 45-RPM record adapter for your 7-inch garage-sale singles and a felt slip mat to keep your records from scuffing on the platter. Overall the sound produced is quite good. 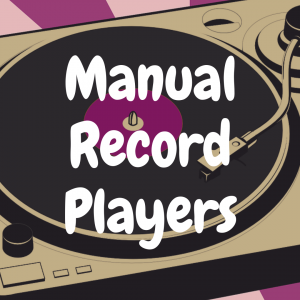 The player’s stylus drops a little heavier than others and it’s higher tracking force means it rides heavier in the groove, which can increase the wear on your records slightly over many plays. The basic version has no USB output but you can pay a few more bucks for this added feature if you want to convert records to MP3. 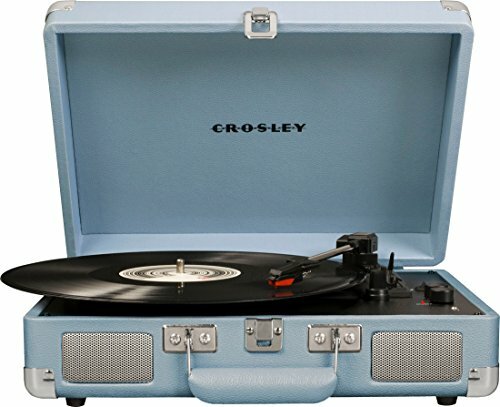 Overall this record player is the cheapest respectable player you can buy, but you can do better with sound quality and more solid parts by going with one of the other players on this list. Next up is the Fluance RT81 turntable. One great advantage of this turntable is easy setup. Right out of the box, the cartridge (needle) is already aligned perfectly, saving new buyers a lot of setup aggravation. It looks amazing with classic features, a sturdy, spring-loaded headshell cover, and a woodgrain finish. It stands on dampened feet to reduce the background noise from vibrations in your house. The arm is counterweighted so there will be less pressure being put on your records. The aluminum tonearm drops smoothly when you lower the queuing lift lever so you won’t hear loud pops through your speakers when the cartridge hits the vinyl. The RT81 also includes a preamp, so you only need powered speakers at minimum, but you can switch it off and play into a phono preamp. There’s also a handy auto-stop feature that shuts down the platter after it gets to the end of the groove (after rotating 17 times). This record player has all the features you will ever want to fine-tune your record playing experience. Unlike the Fluance model, U-turn’s designers wanted to reduce the number of buttons on this device down to just one: the on or off switch. Even the speed control between 33 RPM and 45 RPM is controlled by pushing the drive belt up on onto the smaller part of the drive cylinder. Playing records on this unit is a very hands-on experience. Another example of this is the lack of a quing lever, meaning you need to pick up the tone arm manually, by carefully lifting it up and then over, to start and stop playing. The Orbit comes with a basic dust cover, but you may want to take it off entirely when you are playing it. Like the Fluonce, this player comes from the factory with its Ortofon 2M Red cartridge installed and balanced for maximum quality sound. U-turn offers the Orbit in a wide range of colors to fit your taste. The basic model doesn’t include an preamp, but one can be included as an add-on option, as one of many customizable choices. The sound is completely adequate for a turntable of this price. The external belt drive design separates the belt from background noise, and the included parts are generally of high-enough quality to produce good sound without danger of harming your records. This player has an amazing set of features that make it’s playing quality comparable to models that sell for three times the price. A major feature of the player is that it comes with a carbon-fiber tone arm. It won’t resonate or transfer unwanted noise like an aluminum tone arm would. It has a TPE suspension keeping the motor away from the body to further reduce noise. Like other players examined here, the Debut comes with an aligned Ortofon cartridge, but it also includes a balancing kit for when you decide to replace the cartridge. Like the U-turn, the Debut comes in a rainbow of colors. Also, it does not include a built-in preamp, so you will have to buy one separately. This player is the best of this lot, with all the features one may want to play records beautifully.. It’s an investment, but I’ll keep paying off for many years to come. 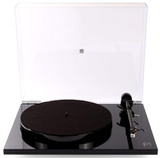 Rega has been making high-performance turntables at it’s UK factory for generations, and offers the Planar 1 at the bottom of its. The high-gloss lacquered body comes in either black or white. Setup is very easy, with bias and balance settings pre-set, and only a few basic assembly steps required before you’re ready to start playing. The Planar 1’s platter is heaviest at the outer edge to create a flyweel effect, smoothing any variations in playing speed. A 24-volt brushless motor adds to the stability and speed consistency of the Planar 1. This player comes with Rega’s own cartridge, a specially-designed carbon moving magnet cartridge which is specifically designed to play at maximum sound quality with this turntable. A drawback of this specialization is that owners may be locked in to fewer choices for replacement needles in the future. If you’re looking for a great turntable from a long and distinguished pedigree, look no further. 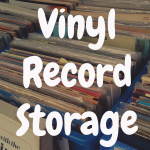 If you enjoyed reading this article, please join our Devoted to Vinyl Facebook page!